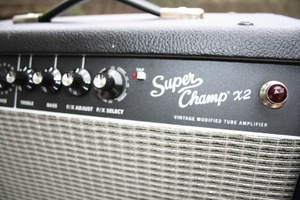 Super Champ X2, Modelling Combo Guitar Amp from Fender. Tell me how you sound and I'll tell you who you are! In the world of guitar amps, war is raging. The transistor forces from the digital world are fighting the tubes army. 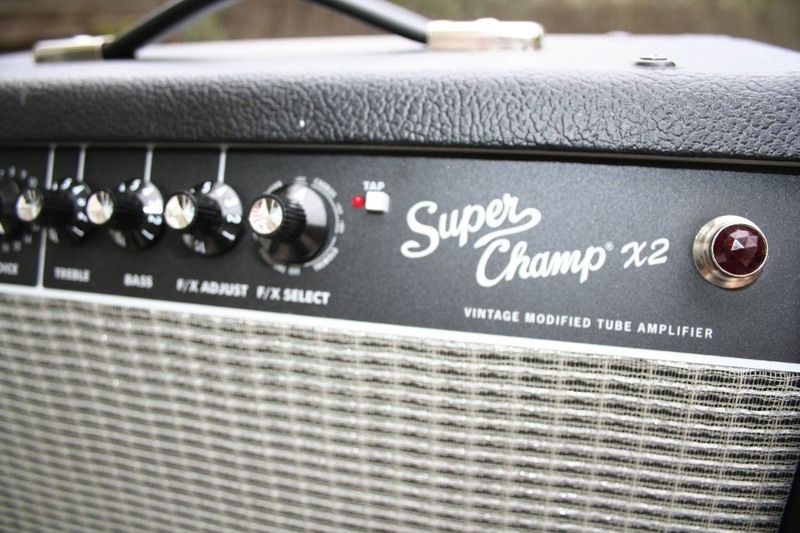 Turning itself into a peace dove, Fender tries to put an end to this war by introducing a hybrid concept: the Super Champ X2. This new amp made in Mexico combines digital technology with tubes has finally seen the light of day. It's on neutral ground so I can start examining the beast. Hopefully this leads to a peaceful co-existence. I thought I would break my back carrying this new amp. But surprise, surprise, the newcomer is light (considering it's an amp! ), so I was able to climb up the stairs carrying it single-handedly. Aesthetically, it is very Fender looking: black vinyl covering and silver grill cloth with Fender logo. The front panel in Blackface style is not what I'd call original, but it still looks very nice. 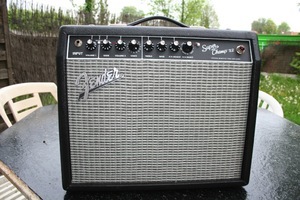 Manufactured from 1964 to 1967, the Blackface is part of Fender's legend. 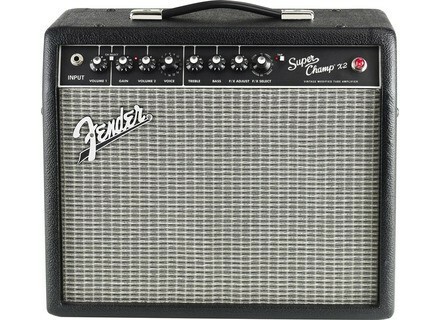 Insiders will understand that I refer to the Princeton Reverb, Deluxe Reverb and Vibro champ. The dimensions are somewhat small (9.2" x 17.5" x 15") and the weight reasonable (24 lbs). It will match a vintage environment perfectly. Under the hood, you'll find all you need to have a blast! You get a pair of 6V6 power tubes for a total output power of 12 watts, one 12AX7 tube in the preamp stage and several transformers matching the tubes. 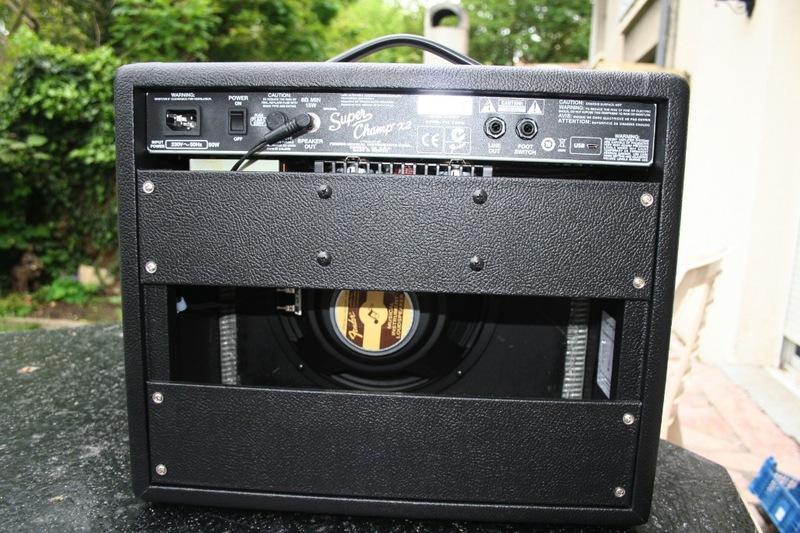 The speaker is a 10'' Fender Special Design allowing the combo to stay compact. Vibratone? This effect was conceived in 1941 by Donald Leslie. The Leslie cabinet (better known as Leslie Rotary Speaker) includes its own tube amplifier. A Leslie amplifies the signal and sends it to the speakers. The sound of the low-frequency speaker is sent to a closed baffle through a rotating drum while the sound of the high-frequency driver is sent to a rotary horn. This speaker cabinet creates interesting sound modulations. The source seems to move forwards and also from left to right alternatively while the loudness varies. One of my worries with digital technology is that you have to turn and push a lot of different controls and you can't understand anything without the user's manual. But don't fear this Super Champ X2: it provides only a few, easy-to-understand controls. The amp provides two separate channels based either on tube or digital technology. Both channels share the EQ section with Treble and Bass controls, the FX selector, the Tap Tempo switch, and the FX Adjust control. Each channel has its own volume control. Plus, there's a channel selector and a 16-way Voice selector. The rear panel is even more simple: a mains power socket with On/Off switch and fuse. You also get a speaker out, a line out, a footswitch connector (unfortunately, a matching footswitch is not provided), and a USB port. When it comes to effects, we've been spoiled: Reverb (Large Room, Concert Hall, spring reverb, delayed reverb), Delay (130 or 300ms), Chorus (fast sweeping, deep sweeping, chorus+delay, chorus+reverb), Tremolo (slow, normal or fast speed), Vibratone (slow or fast speed). I power on the amp, grab my Stratocaster and go! I start with the first, all-tube channel. I set all settings to 12 o'clock and start playing arpeggios with the neck pickup. The sound has a Blackface spirit: good dynamic response, warm tube compression and Fender's typical smoothness. I start trying out various effects with this "natural" channel. 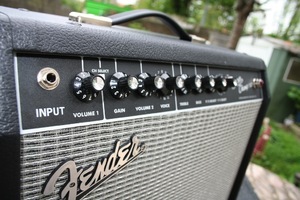 The effects sound well, and the power amp stage warms them up, making them sound softer and more natural. Now, let's switch to the modeling channel. Since you get 16 different amplifiers, I'll try to group them thematically. Let's stay in clean mode and try out the Fender models. All in all, they reproduce the sound of each amp quite well. Only the Bassman model sounds aggressive and has a strong lack of low-end in clean mode. On the contrary, the Tweed Deluxe model provides you with a very heavy low-frequency response perfect for arpeggios. 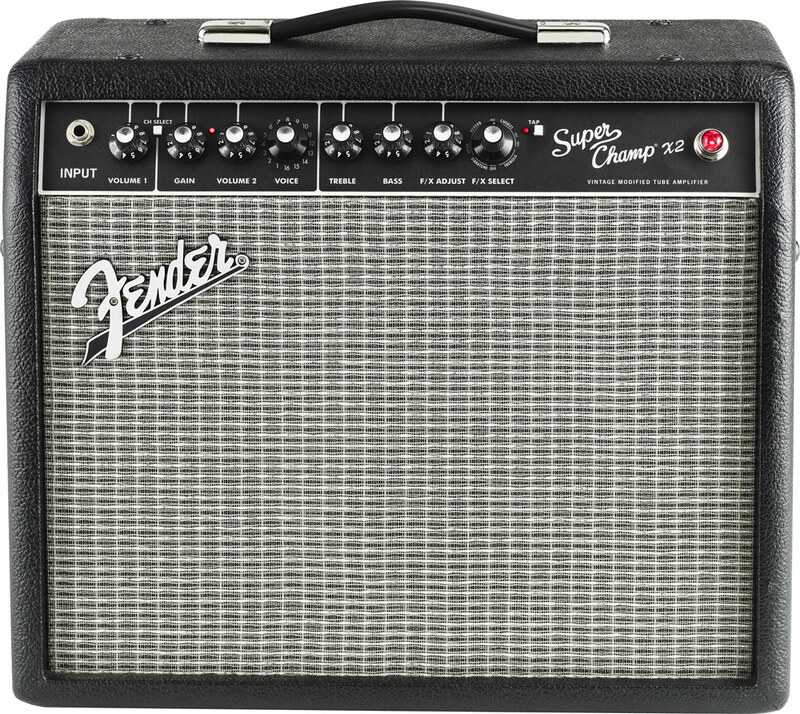 The Tweed Champ doesn't sound muddy thanks to the 10" speaker but retains its own personality. For all sound samples we put two mics in front of the speaker of the amp: a Shure SM57 and a Sennheiser e906 that are hard panned respectively to the right and to the left of the stereo field. Let's leave the Californian sun behind and head towards the British Empire. We arrive just in time for tea and get to pick between three different decades: 60's, 70's and 80's. I take my Les Paul, select the bridge pickup and strum several chords. Traveling throughout the years experiencing sound evolution is a lot of fun. In the 60's, the sound was a bit muddy. As time went by, we notice that high-frequencies start to appear and are (luckily) not aggressive. Finally, the "midrange tone" arrives with fat lows for the last model. My mission goes on in the catacombs of civilization: distortion for the warriors from the north, for the tribal fighters and for the people of the double bass-drum world. I put my Les Paul away and grab my Ibanez RG. Two different paths open up in front of me. I take the road down 90's metal, when the tone was sharp and bright, which was better to cut through a mix. The second path leads down 21st century metal with very heavy low frequencies allowing me to play very heavy without changing the guitar. Add a bit of delay and you can start crazy tapping sessions. I suspect the designers put less work on these two amp models, but they still sound pretty good. With Gain @ 9, my neighbors are already knocking on my door. And, who would've guessed, the knocking matches perfectly the rhythm of All Along the Watchtower. Since I want to maintain good relations with my neighbors, I increase the volume and select the Bassman simulation. It disappointed me a bit when I tried the clean channel, but now it reveals its full capability: it provides a dynamic response, presence and smoothness that are perfect for blues licks. 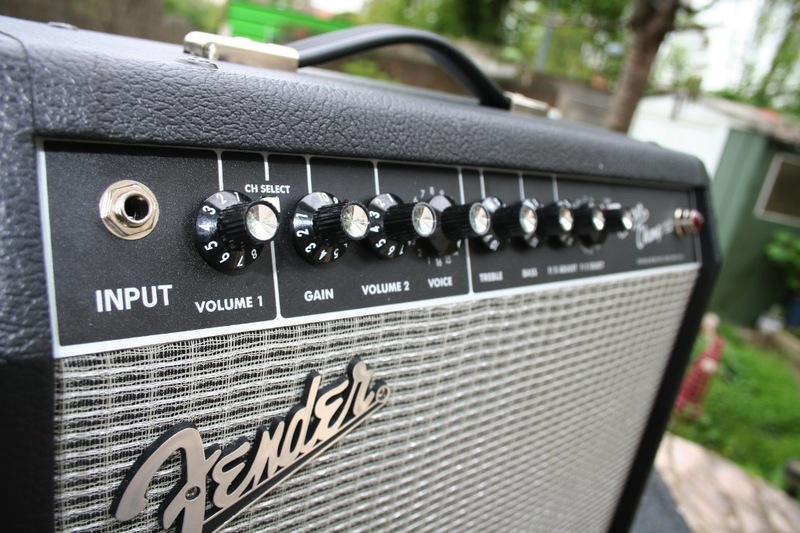 The Californian crunch voices are rather faithful to the original amps. This new toy reveals very pleasant to play and offers many different tones in the spirit of the Mustang Series. The tube power amp warms the tone and compresses the sound of the digital preamp, making it pleasant and authentic. 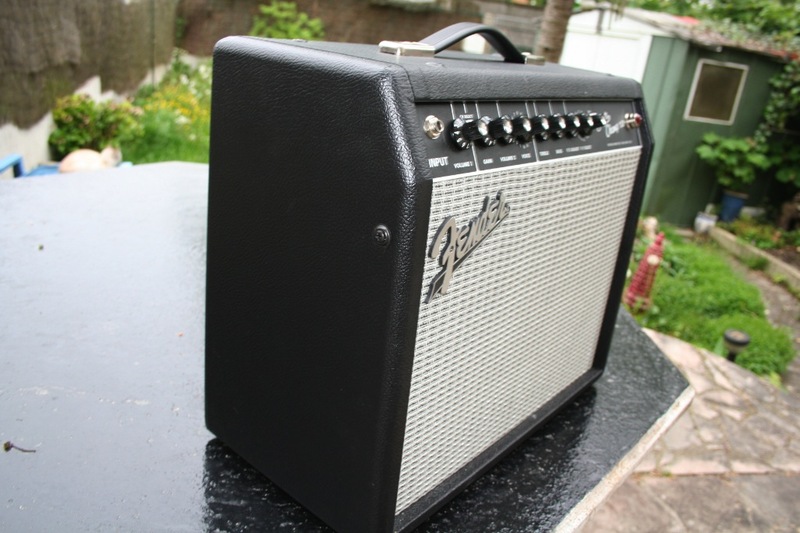 As for output power, I won't take this amp with me to rehearsals so I hope that Fender will launch a 40W or even 50W version. But there's still one last surprise: the USB port! No, I didn't forget! I downloaded Fender Fuse — Warning! 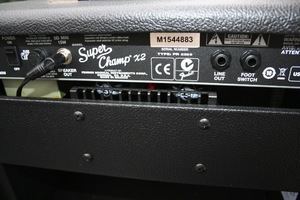 You must download the Super Champ X2 version, otherwise the software won't recognize your amp. You can also download different presets from the website. As soon as I connected the amp it was recognized by my computer and the software starts. I select channel 1 to see what settings the software offers. A small surprise is the mid-frequency control, which isn't on the front panel and can be adjusted via the USB interface! Another nice detail is that when you turn a knob on the front panel, its position also changes on the computer screen. With your computer, you can add stompbox effects (hooked between the guitar and the amp), but also add post-effects like in an FX loop. I decided to add a bit of delay to my distortion sound and discovered that I can choose between nine different delay types instead of only two (like on the front panel). Each delay has its own settings. The same applies to reverbs, there are 10 different types instead of only the three available on the front panel. When it comes to modulation effects, Fender also added Phaser, Pitch Shifter, Step Filter, Ring Modulator, and Flanger effects. 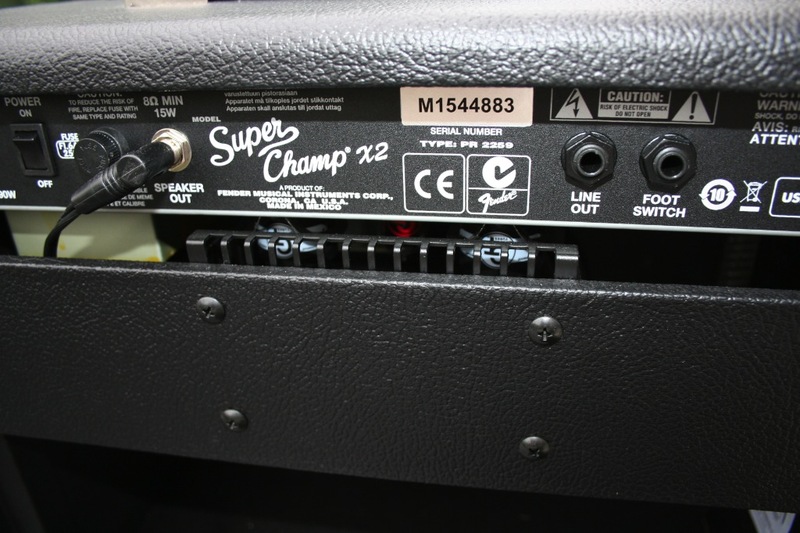 When you choose the amp model, you also get additional controls, for instance Mid (already mentioned), Presence and Cut, plus an additional Gain control for the Super Sonic. The software program is easy-to-use and you'll quickly start your quest for the ultimate tone! A mid setting on the front panel would be nice!